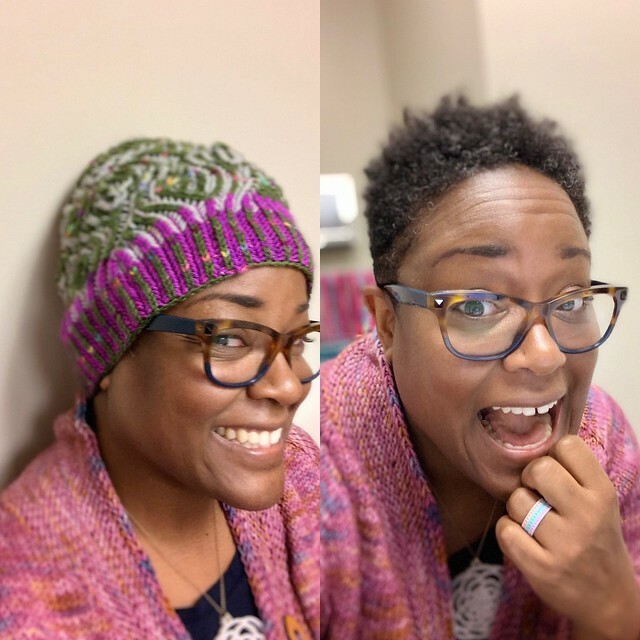 As my hair has been growing, I’ve been growing it more in an upwards direction…which means hats to fit my hair are getting tricky! 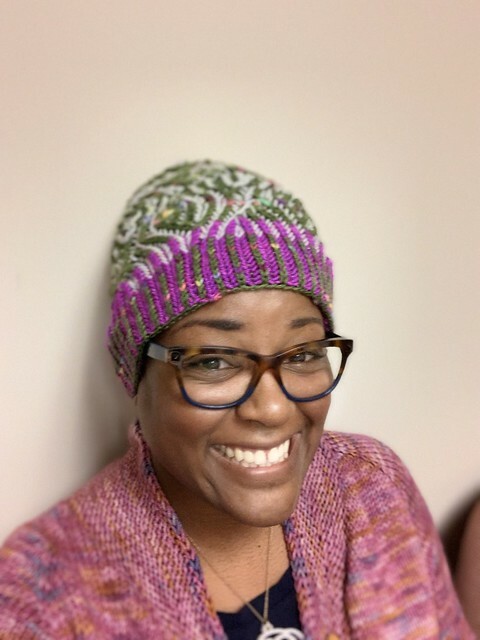 I hadn’t really thought about my hair and how my hats might fit or not fit until I started to put some on and thought ‘well that looks horrible,’ so I was a little nervous as I was finishing my Liebelle Hat I cast on last month. This has been a good commuter project while I ride the subway and I wasn’t in any rush but I finished it just in time for some November snow we had and hoping it didn’t look silly when I finally put it on. And it fits (also I’m wearing my Pink Professor cardigan, I just took out the collar bind off and made a stretchier bind off for a better fit). Fortunately, the hat has enough height before you start shaping the crown and it accommodates my growing mane. And here’s my hair contained and then unleashed. LOL I love it being a bit wild. I picked this pattern because I’ve knit another by Katrin Schubert and I like her brioche designs. 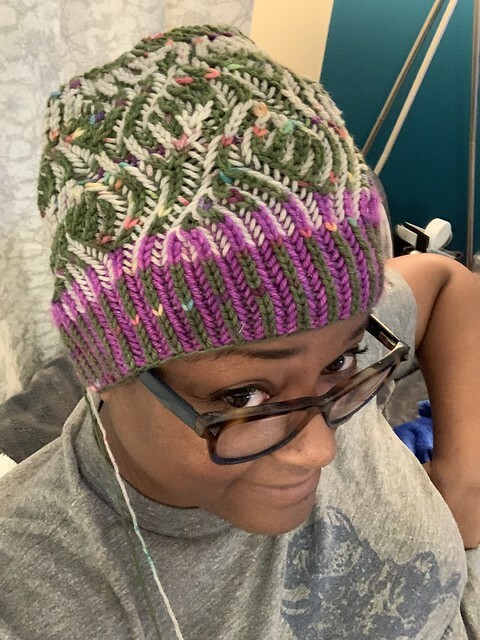 I also know that I do not do gauge swatches for hats (always for sweaters, but never for hats) and after knitting one of her hats before I decided I needed to go down a needle size to a size 3. I also picked this because I could combine a bunch of fun colors and do some striping in the hat. I had a teeny tiny scrap of the sparkly magenta Tempting Ewe yarn from my sister’s sweater I made a while ago. And the light grey is leftover cosmic silver dk from my Dotted Rays shawl (I wear that thing all the time because it’s so big and squishy and warm) and then I pulled out of my stash some limited edition color, Catskills, from the Lemonade Shop yarns. It’s a deep almost olive green with little flecks of rainbow. 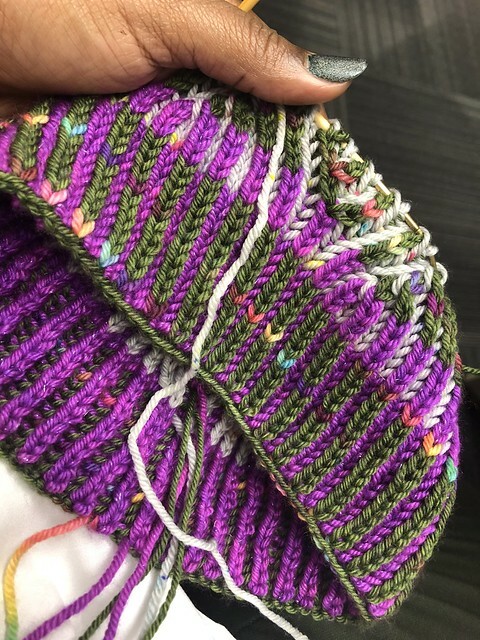 Brioche always keeps me engaged and the end results always make me happy. And because it’s essentially double knit it’s such a warm hat. I was perfectly toasty walking the dogs in the snow. Couldn’t ask for more! Love the hat! It looks great on you. I love your colors and your lovely smile. You are a ray of sunshine! OMG!!! That hat is beautiful and gooks gorgeous on you. Your color choices are always brilliant! So glad you continue to blog, Dana. And, your knitting is colorful and beautiful too! The hat and sweater are both beautiful. I like the way you changed the background colors between the brim and the body of the hat. You’re posts make me smile and, living in the south, I’m a little jealous of your snow – lol. THAT is gor-geoooouuuuussss!!! I love that pink and green together!!! And it looks great on! 😉 Especially with the Pink Professor (definitely one of my DWJ favorites). You look great! Love the new hat and the sweater combo, love the hairdo, and…most important, so good that you were warm in the snow. It was 0F in Winnipeg this AM. Warm is good! I love your pink and green brioche hat! Those are my fave colors and are my Sorority colors. You have great knitting skills. Love your new glasses. I live in the boonies, so when I see items I like to inquire where I can purchase them. Keep up your good work! Love your hat AND your HAIR!! !